Prior to working with Dr. Lamendella, Ryan had the opportunity to conduct research with Dr. David Weber at the University of Maryland in Baltimore and with Dr. Jill Keeney at Juniata College. His first experience involved studying interactions of S100B binding to P53 inhibitors and introduced Ryan to the fast pace of research at a large university. Currently in the Lamendella Lab, Ryan has gained comprehensive experience in project design and the independent aspect of research. He has enjoyed the ability of working on a project that combines field work, wet lab, and dry lab. Ryan has enjoyed working with Caroline on their project with special exception to a night utilizing the wrong MG-RAST database two nights before a poster presentation. “The opportunity to work in the Lamendella Lab has been a fantastic experience both academically and socially.” Ryan plans to apply to graduate school. Participating in three projects in the Lamendella Lab, Caroline is a senior without any prior research experience. At the beginning of the 2012 fall semester, she felt nervous and uncertain about doing any wet lab work. Now, she finds PCR relaxing and pipetting a nice break from studying. Everything about research excites Caroline and she especially enjoys learning the myriads of wet lab techniques and bioinformatics tools. She takes advantage of every Lamendella Lab day, the most exciting lab day being water sampling during Hurricane Sandy. One particularly frustrating moment was preparing for her first poster presentation without initially having any analyzed data. With hard work, perseverance, the help of Dr. Lamendella and lots of coffee, Caroline and Ryan were able to produce presentable data in time for the ABASM conference. Caroline believes “everyone who works in the lab is fantastic” and that “we have so many good ‘write-up room’ memories’ that I can’t think of just one.” She feels fortunate to work with Dr. Lamendella’s since her enthusiasm is infectious and inspirational. In the fashion of a true liberal arts student, Caroline is uncertain about her future and has submitted applications for DVM/PhD. Mitch is a junior is currently working on the Crohn’s disease project. He had the opportunity to be one of the two original students working with Dr. Lamendella during her first summer at Juniata College. Before working in the Lamendella Lab, he worked in a biochemistry laboratory focused on biomass degradation research at Pennsylvania State University during high school. At Pennsylvania State University, Mitch became an expert at making solutions and cleaning glassware. Now in Dr. Lamendella’s lab, he is thrilled to conduct independent research and to have a greater understanding of science and scientific literature. He likes the sense of community in the lab. Mitch is considering pursuing an MD/PhD. Erin is a senior also working on the Crohn’s disease project. Previously, she worked at the Stahl lab at Brigham & Women’s Hospital/Harvard Institutes of Medicine. During her 2012 summer in Boston, she worked on a project determining the role of mannose-binding lectin on coagulant activity in healthy humans. Working in the Lamendella Lab on the Crohn’s disease project is her first experience conducting research during the academic school year. Erin loves the combination of wet and dry lab work in addition to the collaborative nature between the different research groups. Despite the frustrating challenges of balancing coursework with research and sifting through tons of metadata, Erin enjoys the lab culture, never-ending consumption of coffee, doing research as an undergrad, applying concepts learned in class and integrating the multiple disciplines of microbiology immunology, computer science and statistics. Her favorite memories in the lab include seeing beautiful peaks with labmates from the Bioanalyzer on the fracking samples before sending them out for sequencing and winning 2nd place poster award at ABASM with Mitch. Erin appreciates Dr. Lamendella’s never-ending support and guidance in research, the Fulbright application, graduation school applications and life. 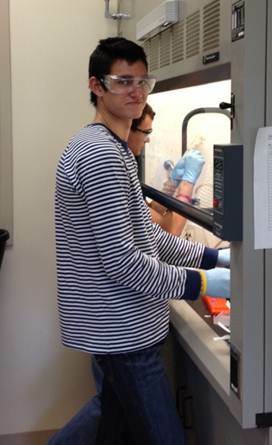 Working in various molecular laboratories during the summers beforehand, Steven is a senior working the oil spill project. Previous projects precluding work in the Lamendella Lab included studying mutational events at telomeric repeat in the absence of a repair protein, exploring transcriptome differentiation of mouse embryonic stem cells into neural cells, and CRISPR acquisition in Salmonella at University of Pittsburgh, UC San Francisco and Pennsylvania State University respectively. Despite battling bioinformatics server downtime and the commonly frustrating QIIME package, Steven finds the intricately connected, awesome moments of research worth the setbacks. These moments include (but are not limited to) obtaining data and seeing emergent patterns that are scientifically interesting. He especially treasures the opportunity to push the limits of human knowledge by sequencing the genome of novel organisms. In addition, Steven enjoys the good dynamic of the lab (“there always seems to be laughter”) and appreciates Dr. Lamendella’s as a good advisor. “Dr. Lamendella is always available to guide us when we have questions about our research but allows us to be independent.” Steven is in the process of applying to graduate school. 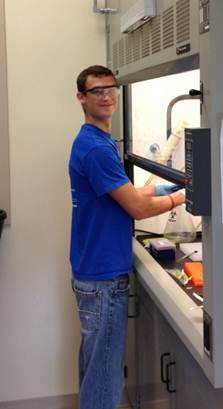 Andrew is a junior and working in Dr. Lamendella’s lab is his first research experience. He plans to apply to medical school and hence his immersion in the translational diet project. However, his overall experience in the Lamendella Lab has been so positive that he has considered switching careers. Andrew is grateful for Dr. Lamendella’s mentorship and is impressed with her availability for answer questions and ability to create a family atmosphere (including home-cooked meals and birthday celebrations). So far, his favorite memory was “witnessing the fruits of everyone’s labor at the ABASM conference, where we won 3 prizes out of the four posters we presented.” Winning first prize at the ABASM conference has served as additional motivation for working hard on the diet project. Andrew has enjoyed working with bioinformatics and looks forward to learning more statistical analyses and wet lab techniques. Working in two Juniata labs and two outside institutions (Universidad de San Francisco Quito, Ecuador and UC San Francisco) previously, Keiko could not resist joining the Lamendella Lab after hearing Dr. Lamendella describe all of her awesome active research projects in Microbiology class. This past summer, Keiko realized how much enjoyment she derived from purely dry lab research while working with Saunak Sen and participating in the Amgen Scholars program at UCSF. Keiko has fun working on the diet project with Andrew and learning about various microbial community bioinformatics techniques. She is sad to leave the dynamic and inspiring lab. Keiko’s favorite memories of working in the Lamendella Lab is split between “rock band for Steven’s birthday, seeing everyone’s reactions after showing them Psy’s music video ‘Gangnam Style’ and late nights in the lab.” Keiko is appreciative of Dr. Lamendella’s endless enthusiasm, support and guidance and is uncertain about her own feature. If all else fails, Keiko will start a business making scientific posters legible/look better and generating laboratory websites.